Which is Philippines’ Better Beach Destination? 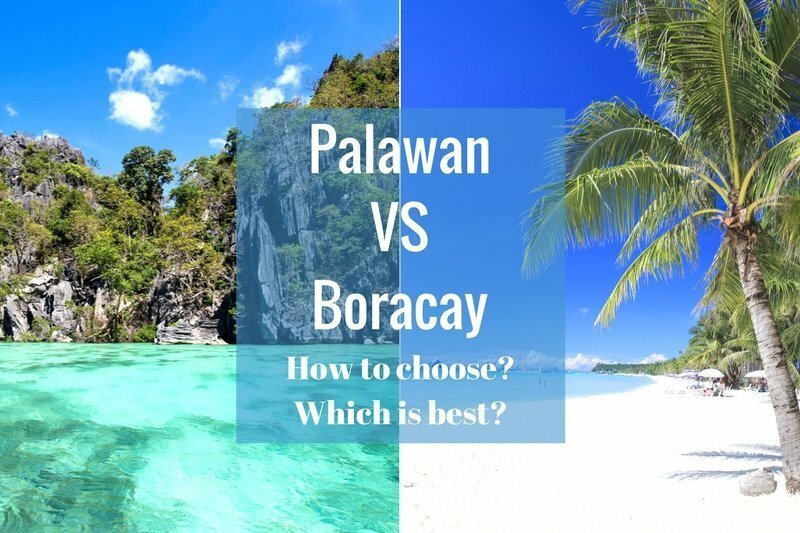 The big dilemma is whether to go to Palawan or Boracay. Here is why you should choose Palawan for your next vacation. Before we get started we should preface this article by mentioning that this opinion is entirely our own. Obviously, we are quite biased as we live on and love our home on Palawan. Although Boracay is great too, we think Palawan is better. Palawan has been declared for more than once as “The Best Island in the World” thanks to its undeveloped islands with their stunning white beaches and crystal clear waters. Beside its exquisite beauty, Palawan is home to an exceptional biodiversity including several species of flora and fauna endemic to the island. Years back, Palawan’s Underground River was voted as one of the 7 Wonders of the Nature and listed as Unesco World Heritage site. Palawan is dubbed as the Philippines’ “Last Frontier” for its natural environment rich in verdant forests, coral reefs and pristine islands – a paradise! Recently Palawan has become one of the most visited places in the Philippines. Aside from Underground River that is Palawan’s most famous tourist attraction, the municipality of El Nido, which is found in in the northern part of the island, has become a major tourist destination. El Nido is well known for its lovely islands, pristine lagoons, white sand beaches, coral reefs, and impressive limestone cliffs. However, despite its charm, Palawan had always stayed in the sidelines of the Philippines’s growing roster of beaches, mainly because of Boracay. Boracay is Philippines’ leading tourist destination known for its fine white sand beaches and lively nightlife. It is a small island located approximately 315 kilometres (196 mi) south of Manila and 2 kilometres (1.2 mi) off the northwest tip of Panay Island in the region of Western Visayas. Over the years, Boracay Island and its beaches have received several awards from numerous travel publications and agencies. Boracay is famous for being one of the world’s top destinations for beach holidays and is emerging as one of the top destinations for Outdoor Activities and Nightlife. In 2012, Boracay was awarded as the “Best Island in the World” – the same award that Palawan has received for two consecutive times recently. Years later after Palawan has gained more fame due to the Underground River, travellers have began comparing Palawan and Boracay. Many would suggest Palawan for a 10-day vacation instead of Boracay since Palawan offers a more extensive range of attractions and things to do. With an endless list of idyllic islets and natural wonders to explore, Palawan is the perfect place for travelers looking for a quieter corner. The beaches and islands of Palawan are far better than Boracay. In additions, there are great things to do beyond beaches: diving, snorkeling, surfing, kayaking and trekking. Boracay is a paradise for partygoers and its nightlife has a reputation for being over the top. The island offers nearly every imaginable beach activity available and water sports include jet-skiing, windsurfing, parasailing, snorkelling, and diving. The main beach is very busy night and day, and it’s hard to find a tranquil space. If you prefer a quiet place where you can get the chance to rest and actually relax, Palawan would definitely be a better choice than Boracay. Many travelers consider destinations such as El Nido, Coron, San Vicente and Sabang, the best places to experience Palawan’s relaxed and laid back atmosphere. Traffic is almost non-existent and the beaches are bigger and with fewer people. Palawan with its natural charm and the relaxed appeal is the kind of place for those chasing road less travelled. Palawan with its deserted islands, care-free vibes and picturesque sea views, is the perfect place to calm your mind and leave your stress behind. If you are after a tranquil and relaxing vacation, don’t go to Boracay – come to Palawan! Palawan is also highly recommended for anyone wanting to discover the local culture and get that “Filipino” feeling. For those who prefer adventure and having a closer encounter with nature, Palawan is definitely a great place to go. Palawan is filled with inspiring natural places to visit: waterfalls, lagoons, mountains, forests and many more. There are a range of treks from relatively short walks, to challenging mountain routes. Compared to Boracay, Palawan has a variety of striking landscapes – any photographer enthusiasts would definitely appreciate this. Despite being two beautiful beach destinations, Boracay and Palawan are different from each other. Palawan is wild, dramatic and remote, while Boracay is busy, touristy and inauthentic. Recently Boracay has been getting complaints regarding the algae situation in the area that usually happens during the dry season in April and May, which are the usual vacation months in the Philippines. The algal bloom makes Boracay’s azure water slimy and dark green. Another growing concern is the cleanliness of Boracay. In April 2018 the Philippine Government decreed a 6-month closure of the island for tourists to undertake major renovation works, especially of the sewerage system, which had become obsolete and insufficient. Palawan, on the other hand, has very few concerns regarding cleanliness since the government in the province itself is making great efforts in maintaining cleanliness and orderliness in the area, along with the help of Non-Government Organizations who are advocates of nature and is on full support on the conservation of Palawan’s environment. Palawan and Boracay are two different islands which have different things to offer depending on what kind of vacation you want to experience. However, Palawan has become more frequently recommended and chosen because of its unspoiled beauty that was managed to be kept over the years, despite the speedy growth of tourism. Tourism has not spoiled Palawan’s paradisiacal atmosphere, unlike Boracay which have gained more disadvantageous points over the past years. Boracay have become a choice to go to for those who are after the nightlife – the partying, the drinking, and the ground shaking music. Palawan, on the other hand, is chosen for its ambiance that is very ideal for those who wants to escape the busy city life and the stressful working days. If you’re the kind of traveller who likes tranquility and relaxation during vacations and trips, Palawan would definitely be the best choice. Indeed, nightlife is necessary and it is also present in Palawan, but unlike Boracay, Palawan has relaxing spots where you may isolate yourself if you do not feel like hanging out and socializing with other tourists, vacations are meant for relaxation after all. You would also want to go to Palawan if you want intimate times with loved ones or during honeymoons, without the hassle of being surrounded by many noisy tourists. If you end up getting tired of stay on the beach, you may opt to explore the lush jungle that is filled with thousand-year-old trees and many fauna species who are endemic to Palawan, you may also opt for kayaking through mangrove forests and try the exotic food “tamilok”, or explore some ancient caves in the vicinity. Unlike in Boracay where the only things you can do is go swimming and party at night, Palawan has a wider variety when it comes to the activities that you may do during your stay in whichever destination you want to go to. Travellers who are looking for a tranquil and a peaceful time with their loved ones while enjoying the beauty of mother nature would definitely enjoy more in Palawan than in Boracay. With so many things to offer, it’s not surprise that Palawan is the preferred travel destination for a memorable vacation. What are you waiting for? Go and make a choice today!